Well, I was right - I wouldn't have gotten through this in book form but listening to it was tolerable. The basic story is exciting enough, and it's been reprised innumerable times both before and after the monk (or monks) sat down in the 11th century (or was it the 9th?) and put pen to parchment. I found the Gilgamesh audiobook (see my review) to be more interesting because it was the story of an urban civilization even if it flourished 5,000 years ago. 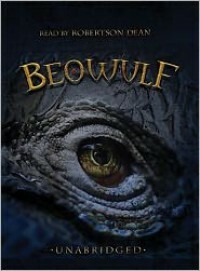 Beowulf, though 4,000 years closer to me, depicts an utterly alien culture and ethos, and presented it in a literary style that I don't enjoy reading.